For more details visit the NULM Website. EST&P component under NULM is designed to provide skills to the unskilled urban poor as well as to upgrade their existing skills. The program will provide skill training to the urban poor so that they can set up self-employment ventures or secure salaried employment. The program intends to fill the gap between the demand and availability of local skills by providing skill training programs as required by the market. For more details related to EST&P program refer to the attached document. Each successful candidate undertaking training under EST&P component of NULM should be awarded a certificate issued by a competent agency which has acceptability in the industry. Assessment of the skills gained should be done by an independent certifying agency. The training agency should not be entrusted with the assessment and certification of the trainees to ensure objective assessment. 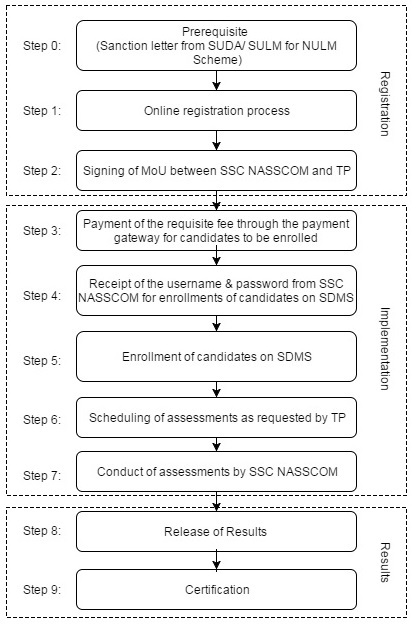 SSC NASSCOM is one the Certification Agency (CA) empanelled for EST&P program.